This evening, 1 August 2018, The Paintings of James McNeill Whistler: A Catalogue Raisonné will be launched online. This is a Beta (First Stage) launch of the catalogue, and it will be extended, edited, updated, over the next year. Tremendous congratulations to the Whistler team here in Glasgow and the USA, for your help and support. We hope our fellow-Whistlerians, scholars, students, artists, collectors, curators, art dealers, and indeed all enthusiasts, will enjoy it. We welcome constructive and admiring comments. Fizz will flow tonight, lemonade even. 100 days, 100 catalogue entries drafted! 1 painting deleted (it turned out to be a watercolour), one added (its a secret...), several re-dated (one of these, by 20 years! ), some re-named. It has been an interesting time, organising research and images and designing the website. Watch this space! Professor Emerita Margaret MacDonald, as project director, and Graeme Cannon, computer consultant, have been working towards the project for several months, indeed off and on for several years. Now we have appointed two new part-time members of staff: Dr Dr Grischka Petri, University of Bonn, as Research Associate, and Carolyn Alexander, as Administrative Assistant. An intern, Alicia Hughes, is also joining the team. Welcome everyone! The website for the project The Paintings of James McNeill Whistler is launched in December 2014, in time for Christmas. This is an exciting moment! What is visible is only temporary, the biography and front pages that indicate the scope of the project. Hidden as yet, but taking shape, are huge image banks, lists of exhibitions and other essential data, and the first fifty catalogue entries. Which will probably be re-written and re-organised several times. Work on the project The Paintings of James McNeill Whistler is now underway - September 2014. Posts are advertised and applications pouring in. Graeme Cannon is setting up the website, perfecting the template for catalogue entries, and Margaret MacDonald trying out the organisation of all the old and new documentary material. Immediately it becomes clear that many works will be re-dated. A lot of work to do here! 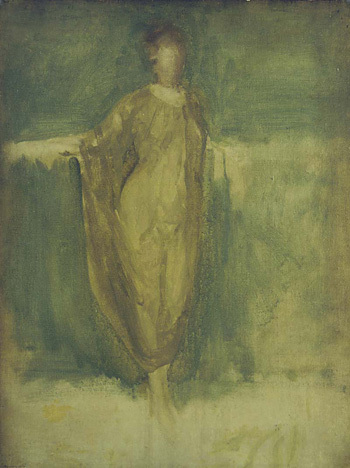 Grant applications submitted for an on-line catalogue of Whistler's paintings? The Lunder Foundation has awarded the Whistler Paintings Project a generous grant, which means we can confirm that work on the project can go ahead. We still seek further funding, but we are very happy indeed with this support. Many thanks to all involved at the Lunder Foundation and the American Alumni of Glasgow University, and above all to Peter and Paula Lunder for their wonderful support!